Pierre Wack was the first leader of Shell’s scenario planning team in the early 1970s. But his work was not about predicting the future. He described his role as being like leading a pack of wolves, scouting ahead and helping the pack get a better understanding of the landscape around them. He called this the gentle art of re-perceiving the present. When things change there is a natural tendency to read the new environment in terms that are reassuringly familiar. In orienteering this is called ‘bending the map’. Those who admit early that they are lost have a greater chance of survival. We cannot hope to make perfect sense of the buzzing confusion around us, but we can do a much better job of finding our bearings. We can take a longer term perspective – recognising that our sense of the future and of the past inevitably colour our reading of the present. And we can start to see and take notice of more of the context around us. Most of us are unaware how much we limit what we notice through preconception, inattention, mindset and cultural habits. Our reliance on numbers and objectivity has downplayed other ways of knowing that are more subjective: knowledge gained from experience, from intuition that we cannot justify, from emotional response, from esoteric levels of consciousness, from the aesthetic arts, poetry and music, from the science of qualities rather than the science of quantities. It is no accident that the root of ‘ignorance’ lies in ‘ignoring’ what we cannot or will not see. Knowledge lives in the darkness and the mystery as well as the light. And it lives, vitally, in relationship and context. In order to know better where we are, we should strive to see as far, as wide and as deep as possible. Systems scientists tell us that structure drives behaviour. We live in ‘business as usual’ structures that have grown up over decades, accumulating power, resources, attention and prestige. They have become dominant precisely because of their success. It is in the nature of powerful systems to argue for their own survival – and we are forced to act accordingly. Taking a longer view, we know that business as usual fades and new ways of operating, more fitting with the changed environment, eventually take over. The challenge is to introduce these new ways in the presence of the old. Simple innovation is not enough: it can too easily be captured and co-opted by the failing dominant system to prolong its life. We need instead transformative innovation – innovation that paves the way to a different future. In nature we find that time is an infinite resource, only physical resources are limited. But we operate on the opposite assumptions. Nature’s way of coping with uncertainty is to diversify, and every move is provisional. We tend to standardise, looking for short term economies of scale, and yearn for certainty when we should put our faith in learning. In unknown territory we need a compass not a map, something to give us overall direction and purpose. We will find that compass not in the surface layers of change but deep in the culture where values live. Expanding our view to include a longer timescale means we must also confront our individual mortality, imagining a world beyond our presence in it. We relish beginnings, innovation and growth. We shy away from endings, closure and withdrawal and do not manage them well: the closing of a factory, the end of an industry, the last days of a life in medical care. Might we find new responsibility in acknowledging the natural life cycle of birth, growth, death and regeneration? 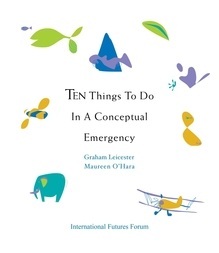 Ten Things to Do in a Conceptual Emergency by Graham Leicester and Maureen O’Hara (Triarchy Press, 2009).